Manzoor Parwana arrested for expressing support for refugees of Gilgit-Baltistan. Manzoor Parwana, the Chairman of Gilgit Baltistan United Movement (GBUM) was detained during a concerted operation of Pakistan's law enforcement, Pakistani Rangers, Khyber Rifles and secret service personnel on July 28, 2011 at approximately 2 PM when he had just finished addressing the annual convention of Balawaristan National Students Organization (BNSO) in Gilgit. Later he was shifted to an unknown place by the secret service personnel for interrogation. According to the FIR, he was arrested for expressing support to the refugees of Ladakh in Gilgit-Baltistan who demand opening of the line of control; demanding re-instatement of State Subject Rule in the region; demanding withdrawal of Pakistani security forces from the region; and demanding basic human rights for the occupied nation of Gilgit-Baltistan. Right after his arrest, Advocate Ehsan Ali, President of Gilgit-Baltistan Bar Association, Engineer Amanullah, Chairman of Gilgit-Baltistan Democratic Alliance, Safdar Ali, President of Balawaristan National Front, Ghulam Shehzad Agha, General Secretary of GBUM, Babajan Hunzai, Coordinator of Progressive Youth Front, and Tauseef Hassan, President of BNSO held press conferences condemning the incident and termed it an attack on freedom of expression and political activity and illegal interference of Pakistani security forces in a UN-declared disputed region. They stated that his arrest was an effort of Pakistani occupying forces to promote state-led terrorism in Gilgit-Baltistan; derail India-Pakistan peace process and defame the nationalist forces, which demand complete withdrawal of occupying forces from their land. Safdar Ali stated that Manzoor has been charged under section 123A, 124A and 153A of Pakistan penal code, which is an immoral and illegal act of the law enforcement agencies since these sections do not apply to the permanent residents of a disputed territory which lie outside the constitutional boundary of Pakistan. Pakistan is a signatory to the resolutions passed by the United Nations Commission on India and Pakistan assuring withdraw of her forces and citizens from Gilgit-Baltistan and other parts of Kashmir. However, it has continued military escalation, amassing more than forty thousand personnel in the region, which is a clear violation of international laws. Babajan Hunzai has demanded release of all political prisoners of Gilgit-Baltistan and an end to apartheid era in South Asia. 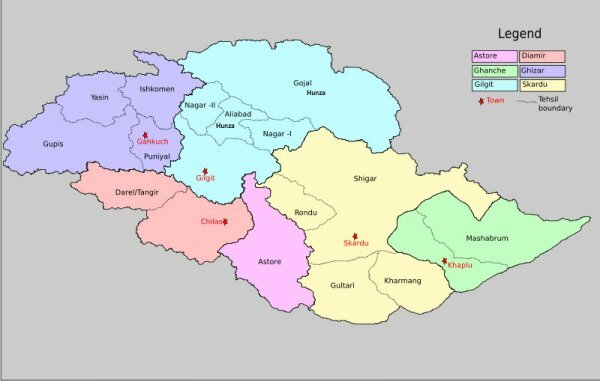 Similar appeal has come from political activists of Kargil district in Indian Ladakh, requesting opening of the line of control and reunification of Gilgit-Baltistan with the rest of Ladakh. In his press release, Ghulam Shehzad Agha said, “Detention of political activists continues in Pakistan and its occupied regions despite assurances of the prime minister to the international community of upholding democracy and freedom of political activity and expression. People of Gilgit-Baltistan cannot be booked for treason since they are not citizens of Pakistan. If supporting the refugees of Ladakh to promote their birth right of free travel, and socio-economic activity is a crime, then GBUM will continue to commit it. GBUM will support rally of the Ladakhi refugees towards the line of control even after the arrest of Manzoor Parwana.” Agha also condemned Pakistani establishment for awarding illegal mining licenses to the Chinese companies, who have their eyes set on uranium rich mineral deposits of Gilgit-Baltistan. Manzoor is currently fighting a sedition case for criticizing Pakistani military for their misgivings during the Kargil War of 1999. His publication called Kargil International Magazine was also banned during the same time for exposing military crimes. He remains vocal demanding freedom for Gilgit Baltistan which remains in Pakistani occupation since 1947. In support of local political parties; Gilgit Baltistan National Congress (GBNC) condemns abduction of Manzoor Parwana who is a seasoned politician and voice of the two million voiceless people of occupied Gilgit Baltistan. GBNC requests International Human Rights organizations including Freedom House, Human Rights Watch, and Amnesty International to take immediate action. GBNC also requests the United Nations, American Congress, the European Parliament and SAARC to take immediate notice of the failing human rights situation in occupied Gilgit Baltistan. GBNC calls for demilitarization of Gilgit-Baltistan, promotion of genuine autonomy and democracy, withdrawal of extremist elements, re-instatement of state subject rule and people to people contact between Ladakh and Gilgit-Baltistan. It asks the United Nations to play its role in empowering local political institutions and ensuring freedom of expression and political activity.